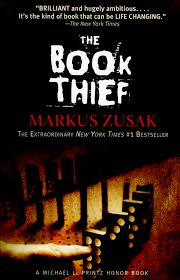 I finally finished reading my first book, The Book Theif by Markus Zusak. I had written a post early about how excited I was after reading the first chapter and just the challenge Liesel had to over come to learn how to read. It wasn’t easy, even through she was being taught by her Papa, that her step-dad who wasn’t a great reader himself. Liesel just kept at it. If you are person who enjoyed reading Ann Franks Diary, then you will most likely enjoy this book. What I really found interesting about reading this book was how the author bring in Death and what Death is seeing and experiencing when he take the souls. I just thought that was awesome and it really impact you emotionally, especially toward the end of the book. That just how I felt. One of the interesting part that really gave me chills or goosebumps when reading was when Liesel, her step mom and dad, along with other people from town are in the basement during a air raid. People and children crying, scared, and Liesel just there hold on to her book and with the courage to begin reading her book. As she reads, people and children begin to focus their attention to her, listening to her voice and the words coming out of her month. As if her voice had a power, more powerful then sounds of bombs exploded. Will not give to much away and hope to hear from other people who also enjoyed reading this book. I read this book as part of the book challenge as well, a very good book to get lost in. I can only imagine what it was really like to be in Germany during World War II and after.